You are here: Home » Edible Finger Lakes Debuts! 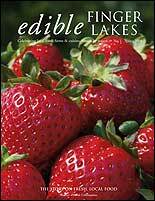 The debut issue of Edible Finger Lakes! Jam packed with Finger Lakes foodie goodness: Wine family at MacGregor Vineyard! Farming at Red Tail Farm! Professional Sausage Making! Cooking and Eating Locally! And … an article by yours truly on local CSAs! The magazine looks fabulous; I can’t wait to see what future issues hold. Congratulations to everyone involved, especially Zoe Becker and Michael Welch, editor and publisher of EFL!